Based on the Atari Coin-Op. 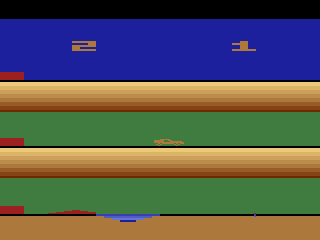 Stunt Cycle was one of Atari's first "Non-Pong" standalone consoles, and was based off the Atari coin-op of the same name. The console consisted of a set of handlebar grips, which you could use to make your cycle move faster or slower and a fire button used to make you jump. 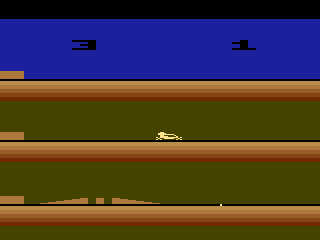 The gameplay revolves around making your "Stunt Cycle" jump over cars (ala Evil Knievel) and land safely on the other side without flying off the end of the screen. Your cycle starts at the top of the screen, where you are given two "rows" of screen space to build up speed before hitting the ramp at the bottom. The "trick" to the game is to build up enough speed to jump over the cars, but not too much that you go crashing off the edge of the screen. If you successfully make the jump the row of cars gets wider and you have to go back and jump it again. It is interesting to note that the arcade version has your cycle move through 'tubes' on the sides of the screen between rows whereas the home console version does not. This means that in the arcade your cycle moves left to right across the first row, then RIGHT to LEFT across the second row before moving left to right again on the bottom. This is a bit more realistic (well as realistic as motorcycle blasting through invisible tubes on the sides of the screen can be anyway) but can mess with your head if you're not expecting it. 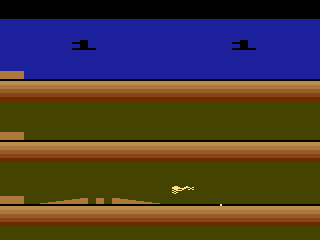 The home console and 2600 port simply has the player 'warp' back to the left side of the screen when he reaches the end, meaning you always travel left to right on each row. 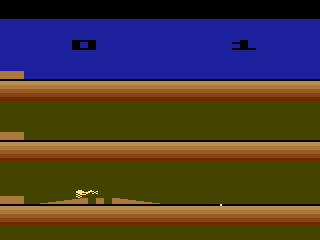 Sometime in 1980 Atari decided that Stunt Cycle would make a great 2600 game, so Bob Polaro was tapped to do the conversion. Using the paddle controllers to simulate the original consoles bike grips, Bob made a near perfect port of the standalone console. One change that was made to the game was the addition of color. Since the original coin-op and home console were from 1976, the graphics were in Black and White which was standard at the time. However Atari 2600 games had to have the option of color or B&W, some color was added to the game (although not much) to spruce it up. After a few months of programming, Stunt Cycle was finished and ready to go. It was around this time that marketing had "brilliant" idea; why not make Stunt Cycle into a Dukes of Hazzard game? So Bob went back to work retooling the graphics to fit the new Dukes of Hazzard theme. The cycle was changed into the General Lee, while the row of cars was changed into a lake. The colors were brightened up a little and some Dukes of Hazzard theme music was also added to the game to complete the illusion. So after a few more months of tinkering, the new Dukes of Hazzard version of Stunt Cycle was good to go. However by this point (late 1980/early 1981) the game was starting to look a bit dated so management decided that a completely new version would be better. So programmer Mark Hahn of the Atari NY field office was tapped to do a new Dukes of Hazzard game from scratch which was also never released. So after a few more months of tinkering, the new Dukes of Hazzard version of Stunt Cycle was good to go, but there was a problem. Cleaver playtesters soon realized that you could change the speed on the car in mid-air! This means you could go full blast at the ramp and then slow down suddenly after you've made the jump, but before you've landed. This basically took the challenge out of the whole game, making it fairly boring. After Dukes of Hazzard was shelved, programmer Mark Hahn was then tapped to do a totally new Dukes of Hazzard game from scratch (which was never released either). Stunt Cycle/Dukes of Hazzard has a few interesting options to keep the game fresh. 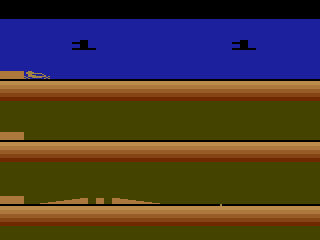 The first three variations allow the player to not worry about skidding out and change their speed mid-air during jumps, this is basically the 'easy' version of the game. The second three variations are the 'pro' mode where players must watch their speed on turns (the invisible tubes on the edges of the screen) or they will skid out and crash, you also cannot change your speed during jumps in these variations. The final three variations are a combination of the two modes in which you can still skid out, but you can also change your speed in mid-air. The difficulty switches also control how large the landing zone will be. Did Atari make the right decision in canceling Stunt Cycle? This is a hard question to answer since it's unknown what Atari's original motives were. 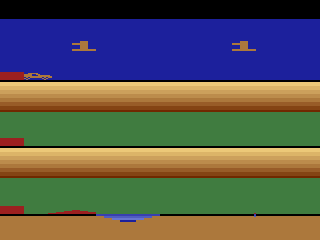 Had Stunt Cycle been released in 1980 as a color port of the coin-op it probably would have been very successful since people who bought it would have known what they were getting, and wouldn't mind the blocky graphics, which were standard for that time. Had Atari released it as Dukes of Hazzard a year later, people would have probably felt gypped as it wouldn't be long before they realized that the game was nothing more than Stunt Cycle with new graphics. Atari made the right decision in not releasing the updated Dukes of Hazzard version, but screwed up by not releasing the original Stunt Cycle version. Chalk this one up to another act of Atari mismanagement. Strangely Stunt Cycle was never mentioned in any Atari catalogs, and was never assigned a product number.